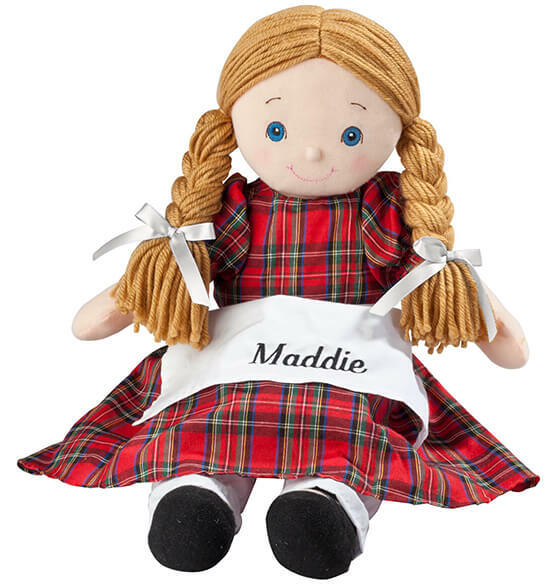 Personalized for one special big sister (or any little girl) this soft, cuddly personalized Big Sister doll is one thing she won’t have to share with her younger siblings! 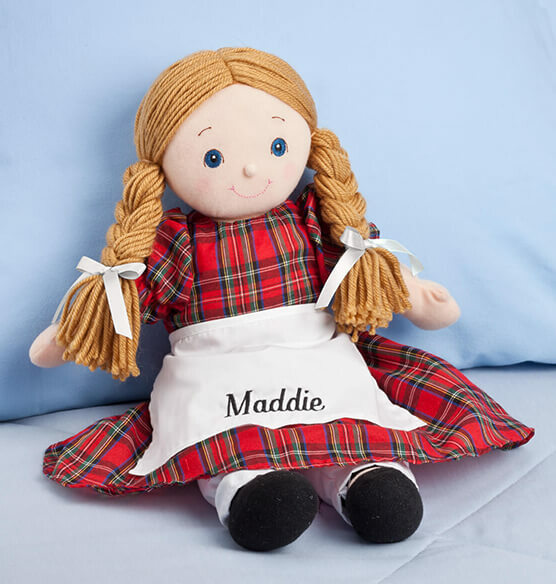 A keepsake personalized doll she’ll love playing with now and will cherish forever, our exclusive doll is simply adorable, featuring long yarn braids with white ribbons, red tartan plaid dress, white apron and pantaloons, along with sewn-on shoes that won’t get lost. A fun gift to celebrate the arrival of a new baby sibling, we’ll embroider big sister’s name on the apron—making it hers alone! Specify name; limit 1 line, 10 letters/spaces. 100% polyester. Clothing removes for machine washing; doll spot cleans. 17" long x 7" wide. A perfect gift for granddaughters! My girls love these dolls. The oldest(4years old) never really played with dolls until these big sister-little sister dolls. Now she plays with baby sister like playing "mommy". It's so sweet to watch. Thank you. I loved the softness of the doll. For little ones it would be a perfect doll that could take a lot of abuse and still look and feel good for the child to carry around with them. Sweet Christmas gifts for our two little look-alike nieces. We know they will love them. This is a gift. I bought it as it was the right size for her to carry and love. I also liked the personalization aspect. I do not know how she will hold up to all the love. I'll post any problems that occur. For now she is just what I ordered. I have to admit to partiality b/c this doll actually looks like my 4 y.o. grand daughter:) Her rather unusual name was spelled correctly on the apron, which is really nice. The removable, washable outfit is a big plus.Also, the braids are fixed in place, cannot be "re-styled" by big sister little hands. And the speedy delivery from Miles-Kimball of this personalized item was amazing and greatly appreciated! my granddaughter was all smiles when she opened her gift but especially happy when it was pointed out that her name was embroidered on the apron. I was expecting a better quality doll for the price.